Recently, I had the pleasure to attend OLC Innovate. Well, not in the traditional sense. Rather, I participated through the available digital mediums at the conference. Twitter was a large portion of my engagement, but I also joined a couple conference sessions hosted by Virtually Connecting and even remotely played games with several attendees. All in all, I connected with many awesome people and participated in several fruitful conversations that I am exited to share. My favorite part of OLC Innovate was the opportunity to attend two virtual sessions. These meetings were well executed, let me connect with others, and helped me join in dialogues from the conference. Matt Crosslin presented over the dual-layer model of mixing xMOOC with cMOOC in HumanMOOC. In particular, he outlined the technologies utilized, design limitations, and challenges experienced while facilitating the course. After his quick presentation, Matt provided four discussion prompts to solicit ideas about the dual-layer model present in HumanMOOC. Following several minutes of group dialogue, everyone came back and shared the ideas they had generated in their small groups. This was my first time to participate in a conference virtually and there were several factors that contributed toward making this a positive experience. 1. Our Onsite Buddy, Autumm Caines, was excellent. She helped make conversations feel natural by angling the camera toward Matt Crosslin or other speakers at appropriate times. Additionally, Autumm helped facilitate the discussion for the digital participants when it was time to break off into groups. 2. The presenter engaged with the virtual participants. Matt made a point to engage our virtual group. This allowed us to contribute toward the overall discussion of the session and Matt made me feel like a person rather than a computer screen. 3. Home grown and accessible technologies make me want to do this again. Google Hangouts on Air was the tool used to virtually connect to this session. Since it is freely available, anyone can use it to reproduce their own virtually connecting style session. The nature of this DIY technology setup resonates with Indie Ed Tech ideas that excite me. 4. My colleagues were attending this session in person. This session was more fun because both of my colleagues, Adam Croom and John Stewart were also in attendance. Sharing this experience made participating in the conversations more meaningful. 5. Technical limitations made the session intimate. Although we did not breach the user limit of Google Hangouts, being confined to ten participants is a good limitation for a virtual session. This restriction yields a small enough group size to allow everyone to engage in discussion. 6. Documentation makes conceptualizing roles easier. There’s a great webpage on virtuallyconnecting.org that outlines the various roles of a Virtually Connecting session. Reading over this gave me a good representation of the different personnel that compose a session. My computer screen while participating in a virtual session—using Google Hangouts & Tweetdeck. Chris Gilliard, Kristen Eshleman, & Hugh Culik facilitated excellent discussion on digital redlining, privacy, and information access. I have been thinking about these topics recently, but I had not heard the term “digital redlining” before OLC Innovate. I am thankful for attending this session because it introduced me to a new perspective on a familiar topic. While I have focused on socioeconomic barriers and how personal technologies play a role in university education, I have not been addressing these issues at their systemic levels. Now when I consider mobile devices as more financially accessible productivity devices, I will think more broadly about the problems facing students. Using affordable mobile devices as an example, how does the variance of cellular data prices versus broadband internet impact students? In the middle of March, as GOBLIN was coming to an end, I connected with John Robertson as he was looking for volunteers to help with a gaming event he was hosting at OLC Innovate. John and I bonded because we were both planning on engaging faculty using the game Keep Talking and Nobody Explodes (KTaNE). Little did I know this would lead me to volunteer at OLC Innovate a month later! @kavubob @jstew511 Sounds like you need to Keep Talking and Nobody Explodes! John’s event, #PlugIN Gaming Session, was a combination of several games. My colleague John Stewart led a game called Artemis while I was setup in another room playing KTaNE. I was excited for this opportunity. How often do you get to remote in to a conference to play a video game with the attendees? In all seriousness, it was an excellent test case for this type of online engagement. Being involved as a volunteer remotely was a positive experience for me. I got to meet some more outstanding people and connect with them through a game focused on accurate communication. It was a fun way to be involved at OLC Innovate and I want to thank John Robertson for facilitating! 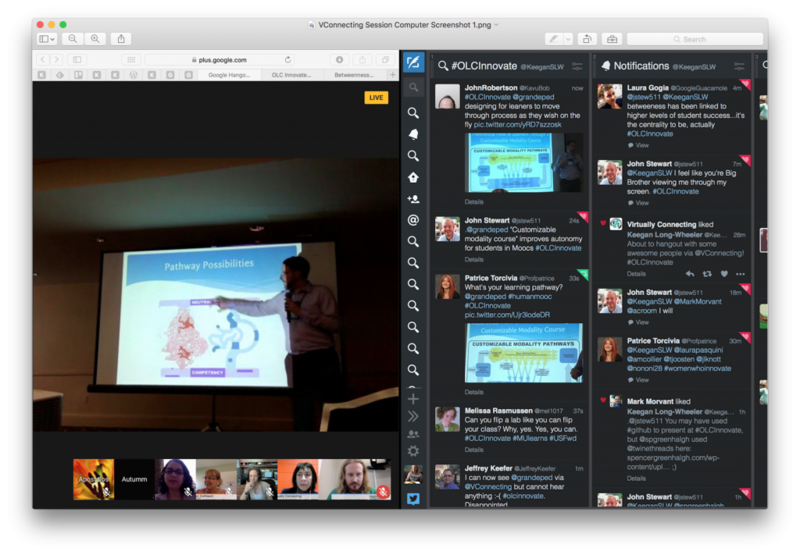 Twitter functioned as my main communication channel during OLC Innovate. More than that, it catalyzed my involvement with the @VConnecting group and the #PlugIN gaming session. Even though I was located in another state, Twitter allowed me to asynchronously engage with the content and hold multiple “innovative” conversations at once. I am grateful to all those that live tweeted during sessions (big shoutout to Laura & Mark) and fortunate to have met so many awesome people online! During OLC Innovate, I setup TAGS Explorer to collect all the tweets containing #OLCInnovate. Originally, I was only interested in the various hashtags used at this conference. Overtime, my interests quickly evolved as others started engaging with the dataset. Now I want to give others the opportunity to play with and analyze the tweets from OLC Innovate. If you are interested, see my post on accessing the open Twitter data from #OLCInnovate. Also, I invite you to explore the open Twitter dataset from OLC Innovate that I recently posted. Lot’s of interesting information is waiting to be uncovered! Finally, thank you everyone for making my first OLC Innovate conference delightful! Even from afar, between the virtual sessions, Twitter, and volunteering in the #PlugIN gaming session, I felt as though I was truly present! The featured image is provided CC0 by Jay Mantri via Unsplash.